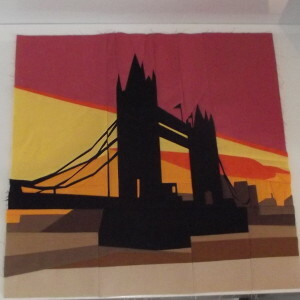 The block of the month I chose to do this year is from Quilt Art Designs and is called Wanderlust – a landmark from different countries around the world each month. 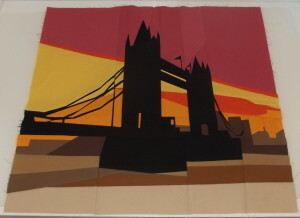 January started with the UK and Tower Bridge in London. This was described as an intermediate BOM, and I thought that was fine, as I’m not exactly a beginner, but it really was quite a challenge! The block had 35 different sections to make and then join together – so many that the usual convention of lettering pieces meant that they go all the way to the end of the alphabet and then start again with double letters AA, AB, AC etc! I didn’t find the actual pieces too tricky to make. There were some very small sections, but they weren’t too bad. It was just the sheer number of pieces. In fact the whole thing wouldn’t have taken as long if I hadn’t used the wrong colour in two places and had to redo those sections – I tried unpicking but it just ripped the paper so I had to print those pieces out and start again. I’m linking up with Sew Cute Tuesday. Your block is awesome! I’m still working on mine and this gives me a little extra inspiration to push on. Man, oh man, that looks so cool in solids. I’ve downloaded that pattern, but that’s as far as I’ve gotten. Nicely done! I’d love if you shared at my new linky: http://quiltingmod.blogspot.com/2016/02/lessons-learned-linky-2.html. I’m even offering up some giveaway bribery. I Love your block! Well Done! I love your block. It is inspirational for all of us who have it but haven’t started it. Thank you for sharing. Thank you – good luck with your block! I am so sad I missed the start of this and cannot afford to buy these patterns – is there any other way to get them ? I would collect the rest of them for the year when they’re free and then either buy the others when you can or wait until there’s a sale to grab them.